A bit over a year ago we hired a brilliant company to configure our Windchill to the workflows etc. that we wanted. One thing we wanted was to do was map our parameters in Creo to Attributes in Windchill, so we could use them to search. So they created a bunch of attributes called MFG1_PN, MFG2_PN, MFG3_PN, MFG4_PN, which are supposed to be Data Type = String. But they accidentally made MFG3_PN "Boolean" data type. Okay, what do I do? I believe there isn't a single Creo object in our database that has a value for this mapped parameter in it. The parameter is there, just empty. Some of our people have had trouble checking in objects because Boolean ain't a string. Even though the parameter is, as I said, empty. I don't know what a Layouts page is. I tried looking it up but I have no idea what they are talking about, sorry. FYI this 10.2. 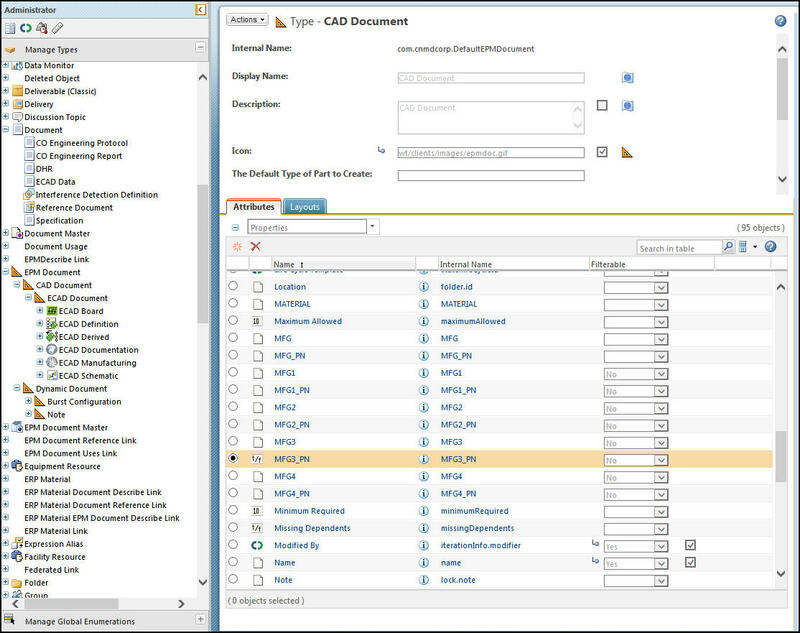 The layout page is where the attribute is defined for filling in the information. You may not have one directly in use as these are Creo mapped attributes. When you do a Promotion Request or a Change Request, the screens that you fill out are generated from the attribute layout information. Tom's CS article has some good links to get into the layout information. Your customizer may have included your mapped attributes on a layout page, or on a default page by the system, and will need to be removed from there before the attribute itself may be deleted. Maybe someone can create some screen shots to show what is happening and how to get there. My system contains classified data and I cannot do it. From the screenshot, it looks like you are deleting a global attribute and the global attribute is used in mapped to one of the attributes assigned to a type. If you are trying to delete the attribute from a specific type say, wtdocument, navigate to that type from Type and Attribute Manager and search for the attribute from the list and delete it. Remember, this will delete the attribute and its values from all your existing objects. As you can see, "MFG3_PN" is a Boolean data type, hence that little t/f in the icon. I can't delete it though. I check the button, but the delete icon doesn't work. I think I have done it. Thanks. I clicked on Edit like you said. I selected the attribute. The delete button didn't work. But I right clicked and selected Dlete from the drop-down menu it did work. Why one worked and not the other I don't know, but I have found that to be the case before. Windchill is an incredibly messy kluge of a program. Knowing what I know about Windchill, I am not convinced this has fixed it - there's probably something else I need to do, but I'll see how this goes. Under Manage Global Attributes, I am now able to delete the obsolete Attribute. So I might have done it! Thanks!